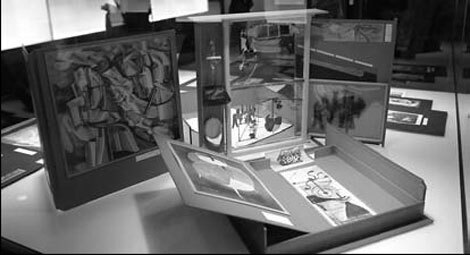 Marcel Duchamp's Boite-en-valise, a portable museum, literally translated "box in a suitcase", consists of miniature reproductions of his key works. Now the box is opened for the first time in Beijing in the exhibition Du-champ and/or/in China at the Ullens Center for Contemporary Art. The compilation of Boite-en-valise was begun in 1935 and completed in 1941. It was produced in an edition of 300, but released in various formats through the remaining years of Duchamp's life and finally completed after his death in 1968 by his widow, Alexina. The first 20 boxes in the edition were all placed in a leather suitcase hence the name, Box in a Valise, and considered "deluxe" because they each contain a unique item. The edition being presented at UCCA is notable for the bright red leather of the box, and contains 80 reproductions of different Duchamp works. While this work serves as a centerpiece, the exhibition also displays additional context related to Duchamp, as well as works by 15 Chinese artists, including Huang Yongping, Wu Shanzhuan, Zheng Guogu and Yan Lei. 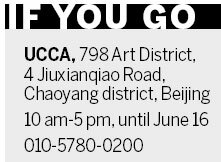 According to Tinari Philip, the director of UCCA, this exhibition is the most comprehensive one of Duchamp's work yet mounted in China, and an investigation into Duchamp's lingering influence on the development of contemporary art in China. In the 1980s, as China began to engage with the Western art of the early 20th century, artists like Wu and Huang found direct inspiration from Duchamp's works. Huang, who founded a Du-champian collective called Xiamen Dada in the mid-1980s before emigrating to Paris, reflected in 1987 that, "Only now am I really able to understand the state of mind that made Duchamp say, 'The traditional idea of the painter with his brush, his palette, his turpentine, is an idea which has already disappeared from my life.' This is a revolutionary and irreversible change for me." During the 1990s and early 21th century, a subsequent generation of Chinese artists including Yan Lei, Song Dong and Zheng Guogu continued to reflect Duchamp's influence. Yan shows a painting from his Covers series, depicting Duchamp's Fountain as rendered on the cover of a Taschen monograph. Zheng transformed a series of ordinary plastic bottles into brass at the turn of the 21th century. Both echo Duchamp's famous "bottle rack" readymade. The show is curated by Francis Naumann and John Tancock, two New York-based scholar-curators, who together have a deep knowledge of Duchamp and contemporary Chinese art.